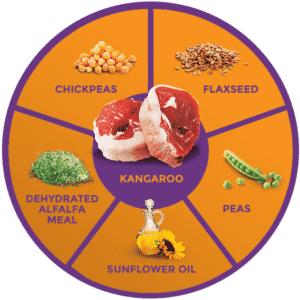 Our Kangaroo Formula features a novel, lean animal protein that also happens to be one of the healthiest meats in the world. Rich in nutrients, Kangaroo has twice the amount of Vitamin B12 than any other meat protein. This means twice the fuel for healthy nerve and blood cells, which leads to healthy functions throughout the body. It also has high Omega-3 content for good heart health. Our Kangaroo Formula is always grain free to help reduce food sensitivity and allergies. Zignature® Kangaroo Formula – Learned from Nature, Crafted to Perfection. Kangaroo, Broth, Peas, Sunflower Oil, Carrots, Chickpeas, Agar-Agar, Sun-Cured Alfalfa Meal, Choline Chloride, Salt, Tricalcium Phosphate, Calcium Carbonate, Potassium Chloride, Cranberries, Blueberries, Minerals (Zinc Proteinate, Iron Proteinate, Copper Proteinate, Manganese Proteinate, Sodium Selenite, Calcium Iodate), Vitamins (Vitamin E Supplement, Thiamine Mononitrate, Niacin Supplement, Calcium Pantothenate, Biotin, Vitamin A Supplement, Riboflavin Supplement, Vitamin B12 Supplement, Pyridoxine Hydrochloride, Vitamin D3 Supplement, Folic Acid) L-Carnitine.